Part of achieving good outcomes for our patients requires defining what success looks like. For a patient with a brain tumor, success means meeting three criteria. First and foremost, we want to do no harm, so the patient should not be neurologically impaired as a result of the operation. Second, the operation should establish or confirm a diagnosis. And third, we should remove as much of the tumor as possible to assure the best long-term outcomes. While easy to articulate, sometimes it can be quite challenging to meet this exacting standard. I recently operated on a young woman with a newly diagnosed tumor thought to be a low-grade glioma. The tumor had been found incidentally, but given its size and the likely diagnosis, the woman needed resection surgery. Moreover, she ideally needed an operation that would remove all of the visible tumor, as we know that maximal resection of these types of tumors leads to the best patient outcomes. That said, the tumor was in an extremely delicate part of the brain. A so-called dominant hemisphere lesion, this tumor interacted with parts of the brain we know are critical for not only movement but also speech. However, the patient was left-handed. 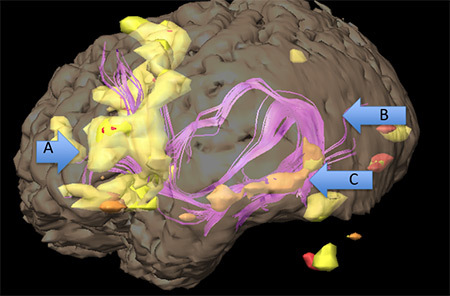 In some left-handed people, speech function can be on the right side of the brain. To help figure this out, I got a functional MRI scan. 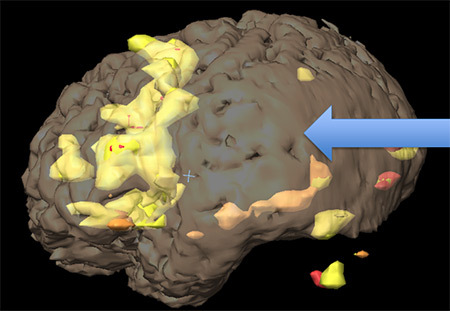 This image from a functional MRI (fMRI) shows language-related areas of the brain. Arrows point to Broca’s area (A), the arcuate fasiculus (B), and Wernicke’s area (C). These scans can be invaluable in determining where in the brain certain neurologic functions reside. It makes an operation more efficient if I know where in the brain to start looking for language function. As with most patients, this young woman was left-hemisphere dominant, meaning that her language function was located on the same side as the tumor. This added a layer of complexity, as we needed to preserve her language ability while removing as much of the tumor as possible. At this juncture it’s helpful to attempt a definition of language itself. The five main components of language are phonemes, morphemes, lexemes, syntax, and context. Phonemes refer to the smallest unit of sound that may cause a change in the meaning of language, but doesn’t have meaning by itself. Morphemes are the smallest unit of a word that provides meaning. Lexemes are the set of all inflected forms of a single word. Syntax is the set of rules by which a person constructs full sentences, and context is how words within a language interact to create meaning. Top these concepts off with grammar and semantics, you have language. But that’s a linguist’s view of language. As a neurosurgeon, I need to be practical when I test speech intraoperatively. On one hand, I need to know if a certain part of the brain is required for you to actually speak. On the other, I need to know if a certain part of your brain is required for you to understand language, either when someone speaks to you and needs a rationale response or when you’re shown an object and asked to name it. The arrow on this fMRI image points to an area of the brain where surface swelling indicates the presence of a tumor below. After looking at her fMRI (done by my fantastic neuroradiology colleague Dr. Linda Heier), I knew this patient needed an advanced operation to safely remove her tumor. As described above, language itself is a broad concept with many distinct components. However, practically speaking, it is relatively easy to test during an operation. With stimulation of the exactly right part of the brain, parts of language function cease — so we know to not remove that area of brain. Indeed, geographically distinct parts of the brain control different parts of language, which we can exploit intraoperatively. Wernicke’s area, the part of the brain that helps you interpret both spoken and written speech, was located immediately next to and underneath the tumor. The arcuate fasiculus, a white-matter cable that connects different speech parts of the brain, was draped over the top of the tumor. And finally, the corticospinal tract, the cable that conveys movement instructions to her arms and legs, was located just to the right of the tumor. To take this tumor out safely required an awake craniotomy to map both motor and language function. And that’s what we did. In conjunction with a neuropsychologist, Dr. Kenneth Perrine, we mapped the areas of the brain responsible for motor function and then identified the areas of the brain critical for her language function. This enabled us to pick a surgical route to the tumor that would not harm these neurologic functions. Furthermore, as we removed the tumor, we asked her to continue a normal conversation, which allowed me to remove the entirety of the tumor without sacrificing language function. What struck me during this operation was the accuracy of the functional MRI scan. Wernicke’s area was exactly where the MRI said it should be, with terrific spatial resolution. Why is this so amazing? Well, functional MRIs work by looking at regional changes in blood flow while patients are asked to perform certain tasks, such as speaking. And ultimately MRI works by evaluating the energy from spinning hydrogen protons that are put through an oscillating magnetic field. So while functional MRI is not a new technology, its physical basis remains an amazing technologic achievement that can help surgeons achieve the best outcomes for our patients. In addition, MRI technology continues to evolve. The imaging algorithms are becoming ever more advanced, allowing for automated identification of eloquent brain areas. Visualization is improving, allowing us to see things at astonishing resolutions. And it has demonstrated itself to be a valuable intraoperative partner, with procedural MRI used for myriad applications. These include evaluating how much tumor has been removed during surgery or even how much heat energy we have delivered to tumors when we deploy laser therapy. I’m certain future treatments that involve drug delivery in the brain will require real-time visualization of drug diffusion to help ensure efficacy. So while neuroimaging and neurosurgery have always been partners, the partnership is only getting stronger with time as advancements in technology help us take better care of our patients.